The United States Treasury has just unveiled a new version of the $100.00 dollar bill. This bill is supposed to make it harder for people to counterfeit. It has a 5 or so anti-counterfeit bits including. All in all a good loocking bill. 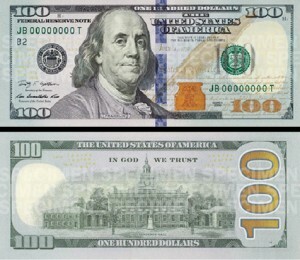 I can’t remember the last time I had a $100 bill however as almost everything i purchase over $30 is with a card anyway. What do you think about the new bill?